The Premium subscription has a unique feature that permits users to add private terms which will be visible only to the user (or their colleagues if multiple licences are bought by a company). Under the corporate subscription, if the user subscribes to 10 licences, all 10 users can add and view the Private Terms. Collocation (two and more words terms in your specific domain, along with their meaning and subdomain). Apt Phrase (along with the general phrase on which the apt phrase is based). Verbose Phrase (and the corresponding approved shorter term; avoid clichés in your writing). Forbidden entry (and the corresponding approved entry). 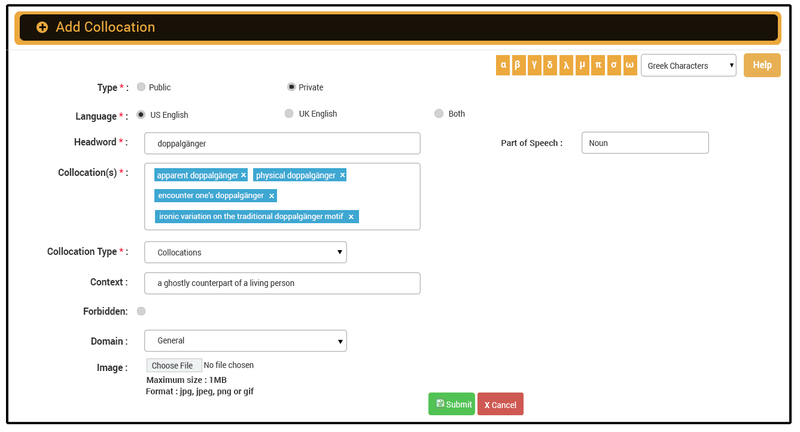 This option can also be used to add approved and synonym terms in Simplified English. Each user can add 100 private terms per annum and upload 15 images (jpeg, png, gif, jpg) of up to 1 MB each per annum. Those limits can be increased by paying a nominal fee. A Premium User can specify particular private terms as forbidden. The user can hover over the red icon to see the preferred term in search results. This is extremely useful when avoiding prohibited terms, overused terms, synonyms (in Simpliﬁed English), clichés, and so on.